Francisco Pascual Tranquilino, a doctor and University of the Philippines professor believes that former President and now Pampanga Rep. Gloria Macapagal-Arroyo is deserving as the new House Speaker, who has more class and demeanor of a leader. Tranquilino, who is a also staunched supporter of President Rodrigo Duterte said that Arroyo observed due process until all amateur cases filed against her were dismissed by the courts due to lack of evidence. 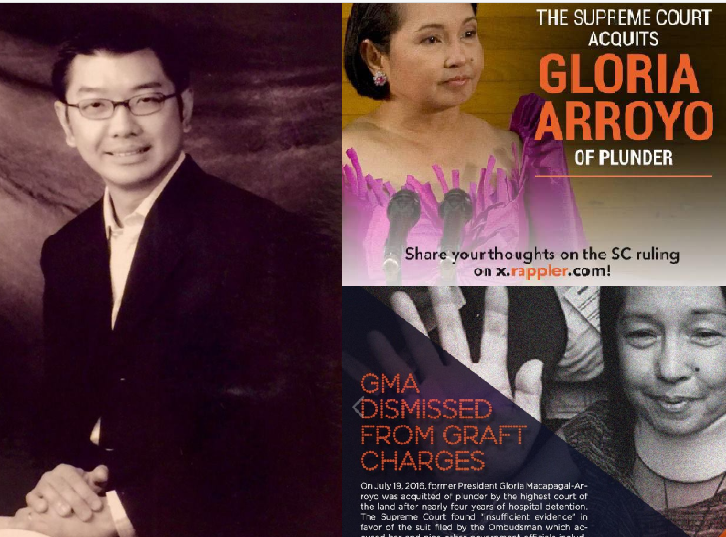 “After being persecuted, prevented to travel, unlawfully detained and hospital-arrested, GMA observed due process until finally all cases against her were dismissed by the courts one by one for lack or insufficiency of evidence.” He said. In his recent Facebook post, the doctor also slammed the detained Senator Leila De Lima, who was then the Justice Secretary for preventing the wheelchair-bound Arroyo in 2011 for leaving the country due to medical reasons despite the temporary restraining order against the Circular. Tranquilino said that unlike De Lima who likes to throw insults at Duterte even in jail, Arroyo showed grace under pressure, and never badmouthed her tormentors. “THROUGH IT ALL, GLORIA ARROYO DEMONSTRATED GRACE UNDER PRESSURE, WE NEVER HEARD HER BADMOUTH HER TORMENTORS, THOSE WHO PERSECUTED HER (THE VINDICTIVE NOYNOY, CONSTITUTION-VIOLATOR DE LIEma, TRAITOR DINKY, et al.). Compare that to De LIEma who continue to issue press statements lambasting and calling Duterte as “Demonyong Berdugo,” even while she is already in detention” he said. On July 17, 2018, the Supreme Court already upheld its decision that what De Lima did to Arroyo was unconstitutional, as DOJ secretary has no authority to stop an accused of leaving and only trial courts can issue the hold departure order. “Arroyo was detained for 4 years by virtue of this unconstitutional order by De LIEma and after numerous non-bailable plunder charges were hurriedly filed against her to further prevent her from leaving the country.” Tranquilino said. “WE HAVE NO RIGHT TO DENOUNCE HER LEGITIMATE ELECTION AS THE NEW SPEAKER OF THE HOUSE BY REHASHING THE DISMISSED CASES BECAUSE AT THIS POINT, THE COURTS HAVE DECLARED HER INNOCENT OF ALL THESE CHARGES.” he added. 1. FERTILIZER FUND SCAM 2004: Agriculture Undersecretary Jocelyn (Joc-Joc) Bolante was accused of diverting at least Php 728 Million in fertilizer funds to President Arroyo’s 2004 election campaign. The controversy broke out in 2006. Bolante fled to the US to seek asylum but was eventually deported back to the Philippines. In November 2008, he appeared before the Senate and denies the allegations, and cleared Arroyo of any involvement. All in all, complainant’s allegations of respondent’s criminal liability for violation of Section 3(e) of RA [Republic Act] 3019 lack any factual or legal basis. This Office has no other recourse but to dismiss the case,” it read. Plunder cases require commission of the offense and the Ombudsman ruled that the complainant failed to present proof of Arroyo’s knowledge of and participation in the scheme allegedly perpetrated by former Agriculture Secretary Luis Lorenzo and Undersecretary Jocelyn Bolante. Bolante signed the issuance of the special allotment release order, by authority of Lorenzo, to the regional field units for the fertilizer fund project. Plunder charges against them are pending at the Sandiganbayan. The said decision was actually dated May 8, 2013 but was only approved by Ombudsman Conchita Carpio-Morales a year later. “All of the documents submitted by complainant were prepared and signed by other persons, and not by respondent. Not one of them may be traced back to her. Thus, no reasonable conclusion may be made that she, directly or indirectly, took part in the alleged irregularities that attended the entire process in the release of the fund,” it also read. In this case, without proof that respondent actually authorized the acts complained of, she cannot be held liable for the illegal acts of her subordinates,” the Ombudsman said. In October 2013, the National Bureau of Investigation filed plunder case against former President Gloria Macapagal-Arroyo and three members of her Cabinet along with 19 other people for alleged misuse of at least P900 million from the Malampaya fund. Also included in the complaint were former Executive Secretary Eduardo Ermita, former Agrarian Reform Secretary Nasser Pangandaman, former DAR Undersecretary Narciso Nieto, former DAR Finance and Management Service and current OIC Presidential Agrarian Reform Council Secretariat Teresita Panlilio, former Budget and Management Secretary (now Congressman) Rolando Andaya Jr., Budget Undersecretary Mario Relampagos,Candaba Mayor Rene Maglanque, Angelita Cacananta, Nilda Baui, Dominador Sison Jr. and Ronald Venancio. Others also included were Janet Lim Napoles, Ruby Tuason as well as Presidents and employees of Napoles NGOs. Records showed that on Oct. 13, 2009, Arroyo signed Executive Order 848 that allowed the use of the Malampaya funds outside of the energy industry.The EO was issued five days after then Budget Secretary Andaya made the request to use the fund. “The request preceded the existence of the legal basis for the making of any such request in the first place. The lack of specifity in Arroyo’s and Ermita’s identification of the authorized purpose by which DBM can access the Malampaya Fund resulted in the almost discretionary, if not arbitrary, granting of implementing agency requests for millions of pesos in funds by the DBM,” the NBI complaint stated. From the DBM, the P900-million was released to DAR to help farmer beneficiaries who are victims of typhoons Ondoy and Pepeng. Meanwhile, the NBI said, two months prior to the release of the EO, Napoles already started preparing the documents needed to “corner” the funds from DAR.“Napoles directed her JLN staff to manufacture the necessary documents for submission to DAR, including fake letter-requests from Mayors whose farmer-beneficiaries are supposed to be recipients of the projects to be financed by the P900 million fund,” the complaint stated. ii. Panlilio-P14 million received in cash from Napoles and through bank withdrawal. iv. Ruby Tuason-P242,775 million received through bank for still unidentified principal. The Office of the Ombudsman dismissed the plunder and graft complaints filed against former President and now Pampanga Rep. Gloria Macapagal-Arroyo in connection with the alleged diversion of P900 million in Malampaya funds to bogus projects in 2009. In a 134-page resolution dated December 19, approved on December 23, the anti-graft office dismissed complaints against Arroyo and several others for insufficient evidence. But charges were ordered filed against Janet Lim-Napoles, the businesswoman at the center of the pork barrel fund scam, as well as former Department of Budget and Management (DBM) secretary Rolando Andaya Jr. and former Department of Agrarian Reform (DAR) secretary Nasser Pangandaman. There was no nexus to the alleged commission of the crime of plunder, malversation through falsification of documents, and violation of the Anti-Graft and Corrupt Practices Act,” she said. “Her participation there was to issue an executive order arising from Presidential Decree (PD) 910 which was issued by [former President Ferdinand Marcos] in 1976. She issued this Executive Order 848 allowing the disbursement of funds to calamity-stricken areas because under the PD, among other things, the President can determine the purposes for which the Malampaya fund can be spent,” she explained. Arroyo’s act of signing the executive order did not necessarily mean she was involved in the alleged diversion of Malampaya funds, said the Ombudsman. The deal worth US$329.59 Million with ZTE Corporation and was aimed at improving communications capabilities of the Philippines. In August 2007, Nueva Vizcaya Rep. Carlos Padilla, in his privilege speech revealed that COMELEC Chair Benjamin Abalos has been going to China to broker a deal with ZTE. There were two other corporations with lower bids but were turned down. In September 2007, Jose de Venecia III during his testimony in the Senate revealed that First Gentleman Mike Arroyo told him to “back off” from pursuing the deal. Few days later, GMA suspended the deal. She claimed that the accusations of corruption were uncorroborated. Rodolfo (Jun) Lozada who was then the President of Philippine Forest Corporation was summoned to appear in the Senate because he was alleged to how known information about this deal. However, he fled the country even before the hearing started. He returned to Manila in February 5, 2008 but was allegedly taken by unidentified men, blindfolded and supposed to be killed. The plan did not materialized because his family tipped the media about the alleged plan and that Jun Lozada was being detained by members of the PNP. He eventually appeared in a press conference on February 7, 2008 in La Salle Greenhills and narrated his abduction and how Abalos threatened to have him killed. The Sandiganbayan Fourth Division has granted former President and now Pampanga Rep. Gloria Macapagal-Arroyo’s demurrer to evidence to dismiss the graft and corruption charges against her in connection with the anomalous National Broadband Network (NBN) contract with Chinese firm ZTE. In the NBN-ZTE case, Arroyo was charged with two counts of graft for approving the deal despite being disadvantageous to government and despite knowing its irregularities. She was also accused of having personal gain in the contract. The former President was accused of violating Section 3(g) of the Anti-Graft and Corrupt Practices Act when she allegedly fast-tracked the approval of the project despite being disadvantageous to government. The court also dismissed the case against the former first gentleman and Abalos. In its ruling, the court said the prosecution failed to prove Arroyo’s element of interest for personal gain in the NBN project. Arroyo chaired the National Economic Development Authority (Neda) board that approved the project. The court said Arroyo’s cancellation of the NBN-ZTE contract in 2007 “bolsters the argument that accused (Arroyo) did not hold any interest for personal gain in the approval and implementation of the NBN project.” The justices said because the contract was cancelled by Arroyo in 2007, there was no longer any project to speak of when the Ombudsman filed the case in 2011. The court also said Arroyo could not be held liable for breaching the code of ethics when she had lunch and played golf with ZTE officials in China. "There was no clear and indubitable proof presented by the prosecution that accused PGMA was the recipient. As a matter of fact, there was no evidence introduced on who made the payment,” the ruling read. The court dismissed the graft charges against Arroyo, her husband and Abalos because the prosecution failed to prove that the contract was grossly and manifestly disadvantageous to the government. In the end, the court said the prosecution failed to prove Arroyo’s guilt beyond reasonable doubt. "These cases are then dismissed,” the court added. A Php 366-million plunder suit filed by the Ombudsman in July 2012 against GMA and 9 other former goverment officials. It was filed a week before then President Aquino was to deliver his 3rd SONA, alleged that Mrs Arroyo approved the alleged diversion of PCSO's intelligence funds for purposes not related to the core work of the agency, which is to help indigents and sectors working with them. Voting 11-4, the Supreme Court dismisses the plunder case against former Philippine President Gloria Arroyo and orders her immediate release. The Supreme Court on July 19, 2016 acquitted Mrs Arroyo of plunder as it granted her plea to drop the case against her. This sets in motion her release from the Veterans Memorial Medical Center, where she has been detained since October 2012. In ruling in favor of Arroyo, the justices said state prosecutors failed to prove their charges of conspiracy between Arroyo and her co-accused, including appellant Benigno Aguas. “There was no proof of any amassing, or accumulating, or acquiring ill-gotten wealth of at least P50 million against petitioners Arroyo and Aguas,” the decision read. The Court said the Ombudsman merely proved that Arroyo had affixed her unqualified “OK” on requests for additional confidential and intelligence funds from the PCSO. “This was insufficient to prove that petitioner Arroyo had conspired to commit plunder because the affixing of the unqualified ‘OK’ could not be considered an ‘overt act’ for purposes of plunder because this act was a common, legal and valid practice of signifying approval of a fund release by the President and there was no causal relation to the intended crime,” the Court said. “The insistence of the prosecution is unwarranted. GMA’s approval of requests for additional [intelligence funds] did not make her part of any design to raid the public treasury as the means to amass, accumulate and acquire ill-gotten wealth,” it said. The Court also cited as a fatal flaw the failure of the Ombudsman to identify the “main plunderer” in the case as required by law, which made it very difficult, if not impossible to establish the allegation of conspiracy. The Court said the Sandiganbayan First Division erred when it “completely ignored” these findings in denying the demurrer to evidence filed by Arroyo and Aguas. But the Supreme Court said the Sandiganbayan completely ignored the failure of the Ombudsman to sufficiently charge conspiracy to commit plunder, and ignored the lack of evidence to establish that the accused had amassed ill-gotten wealth of at least P50 million. “There were no witnesses presented to show that petitioners Arroyo and Aguas had amassed, accumulated or acquired ill-gotten wealth of any amount and there was also no evidence to show that the Confidential Intelligence Funds [CIF] of the PCSO had been diverted to either petitioner Arroyo or petitioner Aguas or accused Uriarte,” the Court said. SC Spokesman Theodore Te told a press conference Tuesday afternoon that the Court annulled the criminal case for "insufficiency of evidence" and ordered her "immediate release." Te said the vote was 11-4 in favor of Arroyo's petition to junk a Sandiganbayan ruling that gave the go-signal for her plunder trial in connection with charges that she misused funds of the state-run Philippine Charity Sweepstakes Office (PCSO). Covered by the case aside from Arroyo is former PCSO budget officer Benigno Aguas, who is detained at Camp Crame. He was also ordered released. Quoting from the decision, Te said: “Wherefore, the Court grants the petitions for certiorari; annuls and sets aside the resolutions issued in Criminal Case No. SB-12-CRM-0174 by the Sandiganbayan on April 6, 2015 and September 10, 2015; grants the petitioners’ respective demurrers to evidence; dismisses Criminal Case No. SB-12-CRM-0174 as to the petitioners Gloria Macapagal-Arroyo and Benigno Aguas for insufficiency of evidence; ORDERS the immediate release from detention of said petitioners; and makes no pronouncements on costs of suit." The 11 justices who ruled in favor of the former president are Justices Presbitero Velasco Jr., Teresita de Castro, Arturo Brion, Diosdado Peralta, Lucas Bersamin, Mariano del Castillo, Jose Perez, Jose Mendoza, Bienvenido Reyes, Estela Perlas-Bernabe and Francis Jardeleza. The justices who dissented or voted against Arroyo are Chief Justice Maria Lourdes Sereno, Senior Associate Justice Antonio Carpio, and Associate Justices Marvic Leonen and Benjamin Caguioa. On February 2012, the Ombudsman also cleared Arroyo in the P72-million plunder case in connection with the old Iloilo Airport’s sale. In the supposed misuse of the P530-million Overseas Workers’ Welfare Administration funds in 2003-2004, the Ombudsman also dismissed the case in October 2012. 1. RE Requejo. De Lima’s watchlist order unconstitutional, SC rules.Manilastandard.net, July 18, 2018. 2. GMA cleared in fertilizer fund scam. The Manila Times, May 8, 2014. 3. T Torres-Tupas. Arroyo, 22 Others Charged with Plunder. Inquirer.net, October 3, 2013. 4. MRL Tolentino. Ombudsman clears Arroyo in Malampaya Fund Scam. The Manila Times December 28, 2016. 5. MJ Cayabyab. Sandiganbayan dismisses Arroyo’s NBN-ZTE case.Inquire.net, September 16, 2016. 6. Rappler.com, July 19, 2016.